Whoo Hoo!!! It's time! Our Blog Hop is officially underway! We are thrilled to bring you our latest release available now in our shop! The designs this month were inspired by the classic nursery rhyme "Hey Diddle Diddle" and a sweet afternoon tea. You'll notice there are plenty of sentiments that would be lovely for Valentine's Day or any day you want to let someone know you're "sweet" on them. If you didn't hear, we’re switching things up a bit this year, and showcased four days of sneak peeks in the morning (1st – 4th) and are letting you catch up on all the fun at the end of the week with a big blog hop on the 5th! If you've arrived here from The Peachy Keen Stamps Blog, you're in the right place. If not, you'll want to make sure you hop back there to start from the beginning! Missed a stop? Don't worry, the PKS has the full hop order! I've got a sweet little card to share with you. I just LOVE these new stamps!! I used a super cool Sizzix Flip Its die to cut the card. Those thing are AMAZING!! Our biggest excitement is that this year - a reformatted and better-than-ever Stamp Kit of the Month Club! Check out all the details below and sign up here. The Peachy Keen Stamp Kit of the Month (SKOTM) will now measure 8.5"x 5.5"
Would you love a chance to win additional goodies? Simply hop to all the designers' blogs in the hop and leave a comment on each. "Like" us on Facebook and leave us a comment letting us know what YOUR favorite nursery rhyme is and that you've liked our page. 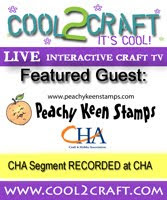 Three lucky winners will receive a $10.00 Gift Certificate to the Peachy Keen Stamps Store! You must leave comments on each blog in the hop and on the PKS' blog to qualify to win. Don't forget, as always, you can snag all the new releases at 20% off for one whole week - 1/5 - 1/12! Thanks so much for hopping with us, HAPPY NEW YEAR! Thanks so much for hopping with us today! Next on the list isat the very talented Janice Wilson's Blog! So lovely Lorie, Love how the card is designed. How super adorable is this Lorie! Loving this new release and your card is just too fun!!! Looking forward to getting these in the mail! Really cute card! Love the cut of it, very cool! This is fantastic! Love it! Beautiful work as always! Too darn cute, love the flip! Love your card Lorie. This new release is awesome. Great nursery rhyme cards! So cute. This is just too stinkin' cute!!! Great job my friend, your creations are always just adorable! These are so cute and of course Awesome Coloring like always my friend. Hope you had a wonderful Holiday and an Amazing 2014! Love your card - so cute and I love the critters. That dog is a hoot. So, cute. Love the cute dog and great coloring. Very cute--I like the flip it feature and the cute dog. Love this type of swing cards...friends never expect it....and the nursery rhymes...have my first grand child and these are perfect. This is so stinkin cute Lorie! I just LOVE how you colored the dog and the awesome design of this card! SUPER COOL! Your card is adorable! Love the paper the characters, your coloring, everything! :) Thanks for sharing! Love your cards, and I agree thost dies are fabulous!!! What a sweet flip it card. The dog fits beautifully and the background papers are perfect.